Kilo trying to get Ketima to get rowdy. Kilo got his name from being such a big fella. His paws are like a polar bear's! Ketima & Kilo are two of sweetest kittens you'll ever meet. They're about 7 months old now & it's hard to believe they were born homeless. They were almost taken to the shelter but even though we're quite full at CR!FR, we welcomed them to spare them an uncertain fate. When the kittens arrived at CR!FR with their Mama Kaleta, they were pretty nervous. Perhaps Kaleta's hissing, spitting & growling had something to do with it. Kaleta was spayed, vaccinated & checked over. After recuperating from surgery, she was returned to her colony. We were then able to see that the kittens didn't have their Mama's temper. In fact, they were quite sociable! Because there was no room for them indoors, Ketima & Kilo set up shop on the enclosed porch. They get to romp in the hay, nap in the sun & sniff noses with the bunnies. They've been the perfect sweeties the whole time. 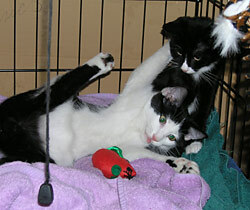 Ketima & Kilo are so easy going, affectionate & so friendly it's a delight. They are constantly purring at top volume. They love attention & being petted & cuddled. They don't seem to be afraid of the dogs or other cats. And of course, they're very playful & a lot of fun. 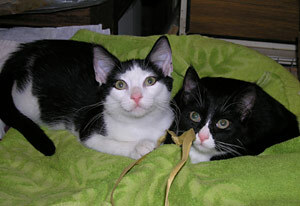 Ketima & Kilo are both negative for FIV & F-Leuk, up-to-date on their vaccines & spayed/neutered. They're ready for a new home! They really want to get out & explore the world, with YOU!